Your Smile Restored with Dentures or Dental Implants in Chaska! 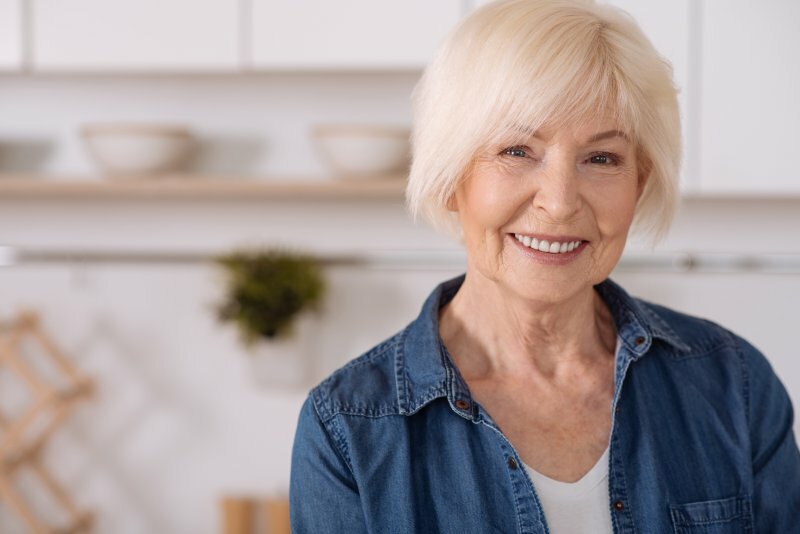 Your memories of eating anything you want or having the confidence to smile for a photo may seem like objects of the distant past, but you now have a chance to make positive changes by receiving either dentures or dental implants in Chaska. How can you determine which process is best for you, though? Read on to learn important details about the differences in cost, treatment time and maintenance of both forms of teeth replacement. Considered to be the most effective form of teeth replacement available, the dental implant process involves the insertion of a sturdy and durable titanium rod into your existing bone. Because of its biocompatible nature, the fixture will eventually fuse with the jawbone to recreate the natural stability of your original roots. Because the dental implant procedure is highly customized to accommodate your specific needs, there is not a set price for the process. You’ll need to first visit an implant dentist for a full examination. Then, the cost of your treatment will be determined based on such factors as the number of teeth you have missing, the condition of your oral health and the amount of bone mass you have remaining. It can take up to six months to complete the dental implant process. That’s because there must be time allotted for healing from the different stages, which include the initial insertion and the placement of the abutment, which is an anchor that screws to the implant and allows a final restoration to be attached. Maintaining dental implants is similar to your normal dental care habits. Thus, it’s important to brush at least two times a day. You can also use a dental floss designed specially for implants to ensure your gums remain as healthy as possible. For patients who are more cost-sensitive or lack the necessary bone mass to successfully undergo the dental implant procedure, there is the denture option. The appliance consists of a set of porcelain prosthetics that are affixed to a pink, resin base that mimics the appearance of the gums. The cost of dentures can vary greatly, with prices ranging from $7,000 to $15,000 for a full set. It too is a highly customized procedure, so to get an accurate picture of your investment, you’ll need to visit your dentist for a consultation. The placement of dentures is non-invasive, but because of the various steps required to complete the process, it can take up to 10 weeks to be fitted with the final version of your prosthetics. Remove and rinse them after eating. Always handle them with care to prevent breakage. Clean your mouth after removing your dentures. When making a final decision on whether to choose dental implants or dentures in Chaska to replace your teeth, it’s important to take all of the above factors into consideration and to consult with a local dentist. What matters most is that you are able to regain the life you once had. Dr. Mark M. Stapleton is a graduate of the University of Minnesota School of Dentistry. Throughout his career, he has remained driven to be as knowledgeable and proficient as he can, which is why he has taken over 500 hours of continuing education and earned the distinction of being a Fellow in the Academy of General Dentistry. Dr. Stapleton replaces missing teeth with dentures and dental implants at White Oak Dental, and he can be reached for more information through his website. Comments Off on Your Smile Restored with Dentures or Dental Implants in Chaska!